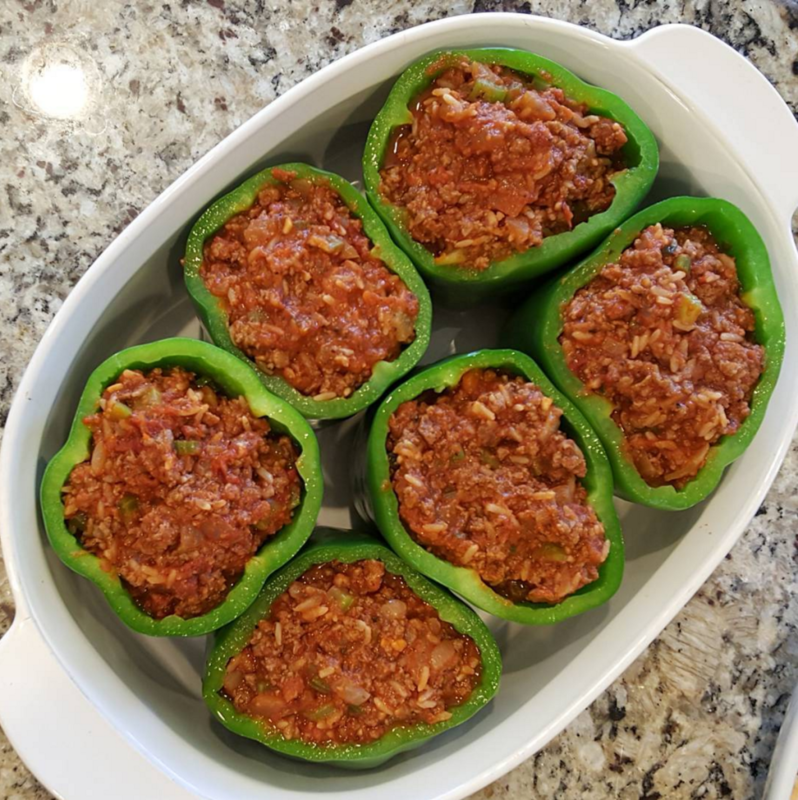 My grandmother always made THE BEST stuffed peppers. They took hours to bake… such a special treat! She left her recipe with me, and I was determined to make these doable as an ‘everyday’ dinner option. . . by precooking the ingredients, as it cuts an entire hour off the bake time! 6 green bell peppers, remove and discard the tops, seeds, and membranes. 1, 25-28 oz glass jar of favorite low-sugar, all-natural marinara sauce. 6 Tbsp favorite cheese, optional . In a large stock pot of boiling water, parboil the peppers until tender, just 3 minutes. Remove and let dry on paper towels. In a large skillet over medium-high heat, add the meat, onions, celery, and seasonings. Cook until the meat is browned, stirring to break up the lumps (drain grease). Add the precooked rice and marinara sauce and stir well. Remove from the heat and adjust the seasoning, to taste. Pour enough water into a baking dish to just cover the bottom, about 1/8-inch deep. 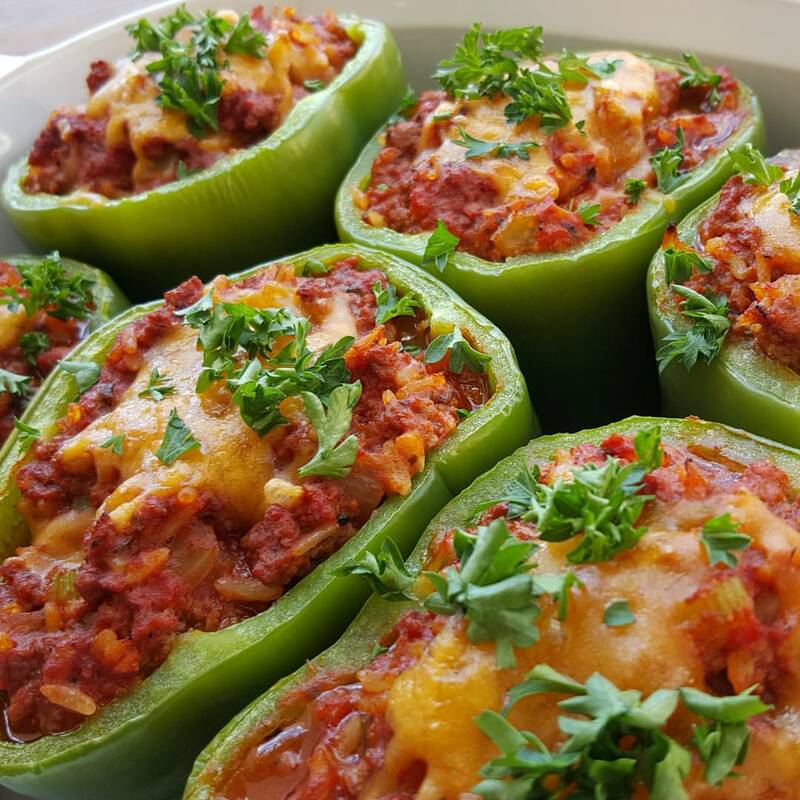 Bake until the peppers are very tender and the filling is heated through, 20-25 minutes. Sprinkle each with 1 Tbsp shredded cheese (optional) and broil for 5 additional minutes. They took hours to bake...such a special treat! She left her recipe with me, and I was determined make these doable as an 'everyday' dinner option...by precooking the ingredients, as it cuts an entire hour off the bake time!